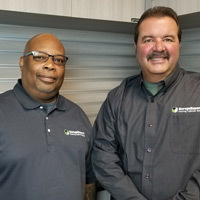 Garage Experts of The Virginia Peninsula is owned by brothers-in-law and lifelong residents Gary Davis and Jon Wallace. Gary and Jon both grew up working in family businesses, so opening a business of their own was something that they both aspired to do. As Gary and his wife Debbie were searching for a solution to transform their own garage space, they discovered Garage Experts and their beautiful and durable floor coatings and cabinetry. Without a location to serve this area, it became the perfect opportunity to combine his and Jon’r;s years of experience in the sales, service, and automotive industries to open Garage Experts of The Virginia Peninsula. Your garage should be a beautiful extension of your living space and Garage Experts of The Virginia Peninsula is here to help! Tired of that dusty, dirty, concrete floor? You will be thrilled with a new Garage FX epoxy floor coating. Have tools, bikes, toys, and such taken over your garage and you spend an hour looking for the one thing you need, or have got to move everything every time you need to get the mower out? Let our cabinets and slat wall storage solutions help you reclaim your space and bring peace and organization to your home. In choosing Garage Experts of The Virginia Peninsula you are supporting a local small business in your community, while receiving the products, services, and support of the national franchise. Gary and Jon have both been factory trained on the flooring and cabinet installation and aim to offer the top-notch customer service experience you deserve. We provide a quality, professional look and superior product that you won’r;t find elsewhere. Our floor coatings and cabinets are made in the USA and are backed by an industry leading LIFETIME WARRANTY. Ready for the ultimate garage makeover? Call 757-330-4245 today to schedule a FREE design consultation and estimate! GarageExperts of Virginia Peninsula is your local garage makeover expert. View some of our recent work.